Here’s the thing: black life matters. And because black life has always mattered, Charles Burnett made Killer of Sheep (1977). His first film brings audiences into the world of black people – not just merely depicting it. It is crucial, because it came at a time where blacks, coming out of the 1960s, were attempting to make their way up the social and economic ladder. 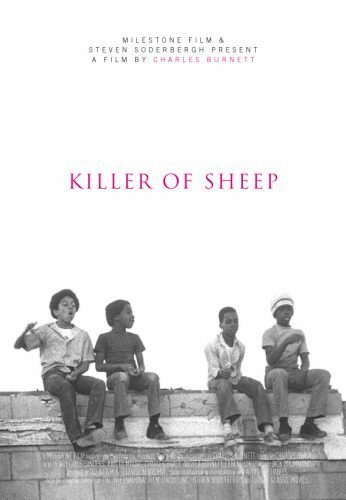 Killer of Sheep was timely, due to the fact that in the ’70s, the black depiction on screen was dominated by Blaxploitation cinema, which after the release of Melvin van Peebles’ Sweet Sweetback’s Baadassss Song and others like Bill Gunn’s Ganja and Hess, portrayed blacks in negative, stereotypical roles that often did nothing to advance the goals of black Americans. It is timeless, because it can serve as a blueprint for any filmmaker to combat those same stereotypical, one-dimensional depictions, as well as help black and other directors contemplate a new way of making film. Stan (Henry Sanders) and his wife (Kaycee Moore) in the film KILLER OF SHEEP, a Milestone Film & Video release. Killer of Sheep centers on Stan (Henry G. Saunders) a slaughterhouse worker, and his family, living in Watts, CA. We first meet Stan on his knees framed in low-angle shot, with someone towering over him. From here on, in this sequence, friends, neighbors, and his wife constantly invade his space. Stan’s daughter stands at the kitchen’s entrance, wearing a dog mask, nearly forgotten. She is the only person not bothering him, and not framed above him but at eye level. Burnett employed the techniques of Italian neorealism: loose shooting, long takes, casting of amateur actors, theme, and editing and coupled those filmic techniques with black concerns – for example the necessity of maturing faster, depicted in the opening scene, where a little boy is chastised by his father for showing a lack of initiative in a situation, or prejudice of skin tone by white store owners looking to hire out blacks, and cultural (items) such as hymns, blues music, classical music by black composers like William Grant Still, introduced through soundtrack – and ways of passing time such as dominoes, playing “the dozens” – and the keeping of the black vernacular. It’s important to emphasize the America part since Killer of Sheep is just as much about a city and its economics as it is about race. Throughout the film, shots of children playing in various areas around South Central LA are interspersed with scenes of Stan, his family, and Stan at work. Burnett used decisive, elongated shots, soundtrack, and rhythmic pacing, to symbolize the aggravating, slow movement up the economic ladder. His filmmaking choices also worked to intensify the lethargy brought on by depression, and being poor. And because the kids are poor and black in America, because industries stand taller – shown brilliantly by Burnett’s framing of buildings and Stan’s work – Killer’s main obstacle is to show what these decedents of slaves value what most do: time and space. It is something we all question as Americans: what am I really doing this for? For oppressed people, it’s worse. In a scene where Stan dances slowly with his wife to Dinah Washington’s “This Bitter Earth,” semi-enclosed in darkness except for a window, Stan attempts to show affection to his wife (Kacey Moore) who has been fuming with desire. When Stan dances with her, she tries to caress him, tries to entice him by kissing him, rubbing him, and bringing him closer. Stan does not react, solid as steel. They go on and she keeps on. She keeps trying infiltrate; to wake him up. He doesn’t go for it and walks away. She walks to the window, stretches out on it, and begins to cry. Her body language, the deep darkness, the shot, the music, says it all: what are we supposed to be doing in here? Stan leaves her in darkness – in her space. It’s where we see her come out of the film most of the time. The places where Stan must help free her from. But how can you do this when the world says you don’t matter? Buildings tower over you, and your people get killed in the streets by the police to prove it. Posted in Side Shots Film Blog and tagged Black Lives Matter, Neorealism, Race Relations. Bookmark the permalink. Trackbacks are closed, but you can post a comment.